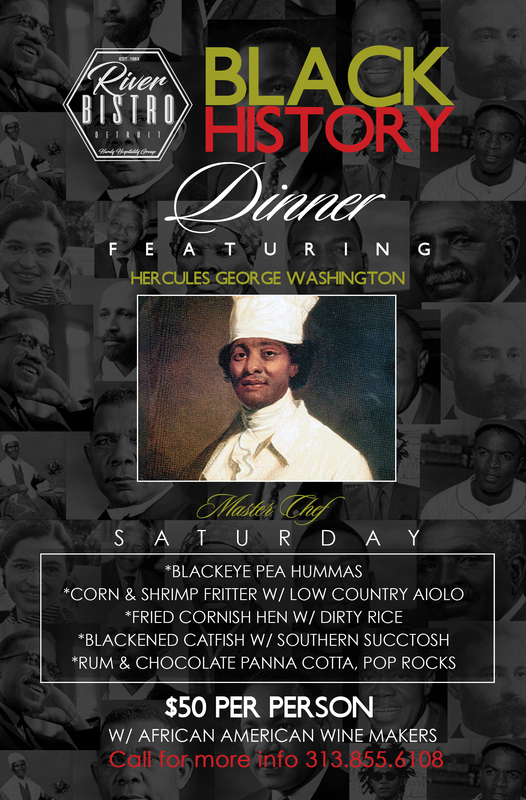 In celebration of Black History in February, Chef Maxcel Hardy, owner of River Bistro, Coop Detroit, and principal at Hardy Hospitality Group, will honor America’s first “celebrity cook,” Hercules with a month-long series of weekend dinners that recognizes the contributions of the first chef of America’s first President George Washington. Chef Maxcel Hardy’s Black History Dinner Series will kick off on Saturday, February 2, 2019, from 7:00 to 9:00 p.m. at River Bistro located on Detroit’s westside Grandmont-Rosedale community at 18456 Grand River Avenue. Tickets are $50 per person and limited to 30 dinner guests for each event on a Saturday in February (February 2nd, 9th, 16th, 23rd). Chef Maxcel has designed an exquisite five-course meal that will feature black-eyed pea hummus, corn and shrimp fritters with a low county aioli sauce, fried Cornish Hen served with dirty rice, blackened catfish with southern succotash, and for dessert, a rum and chocolate pannacotta with pop-rock candy rounds out the planned meal. “I’ve been wanting to do something special that recognizes Hercules – America’s first chef, to the first President of the United States, George Washington,” said Maxcel Hardy, chef, and owner of River Bistro. “As an African-American chef, I’m reminded daily of the contributions my ancestors brought to our country. Everything from fruits, nuts, grains, herbs, and spices to cooking techniques and utensils originating from Africa, the Caribbean, and South America, are all infused with what we eat, and how we eat it in America. In culinary school names such as Hercules, James Hemings, Abby Fisher or Malinda Russell are not discussed as part of the history of American cooking and cuisine – but they should. During this time of reflection and remembrance, I will be hosting a series of special dinners that honors our African-American culinary past, while bridging our aspirations and innovations of our culinary future,” said Hardy. Chef Hercules was born into slavery and earlier accounts of his life are very limited. However, in 1771 Hercules’ presences shows up in colonial Virginia tax records as “tithable” property owned by George Washington. Historians believed Hercules spend more than ten years as a house cook at George Washington’s home in Mount Vernon, and sometime around 1786 had become an executive chef as Washington mentioned Hercules in his diary calling him his “head chef.” Whether at home at Mount Vernon or at the U.S. capital in Philadelphia, George Washington wanted Hercules’ cooking. Hercules was the commander and chief in the kitchen. He was considered a master and well-disciplined at open-hearth cooking, vessel and elevation cooking, warm ash cooking techniques, and the proper use of utensils. While in the kitchen, Hercules did everything and had more than eight assistants. Chef Hercules would have been described as a “dandy,” a well-dressed man unduly devoted to style, always in-fashion and neat. When he would visit the open markets of Philadelphia, Hercules would be dressed in his chef-whites with a velvet waistcoat, a gold-headed cane, and chef’s white neckerchief. Chef Hercules had great deal freedom but was still enslaved under Martha and George Washington. Washington was very pleased with Hercules and his cooking, but having an enslave chef in Pennsylvania presented what would have been considered a political public relations crisis at the time. Prior to taking residence in Philadelphia, the Pennsylvania state legislature had enacted the Gradual Abolition Act of 1780. The law freed any enslaved person who resided on Pennsylvania soil for six continuous months or longer. To skirt the law, Washington would send all of his slaves back to Mount Vernon when the six-month period approached. There his slaves would remain for a few weeks and then be brought back to Philadelphia where the “freedom clock” would resume. In November of 1797 near the end of George Washington’s second term and on his birthday, Hercules planned his escape from Mount Vernon. Where did Hercules go? It remains unclear what happened to Hercules after escaping Mount Vernon, but we do know George Washington had not given up looking for Hercules for more than a year. In a letter he wrote to George Lewis “the running off of my Cook, has been a most inconvenient thing to this family; and what renders it more disagreeable, is, that I had resolved never to become the Master of another Slave by purchase; but this resolution I fear I must break. I have endeavored to hire, a black or white, but am not yet supplied. (313) 855-6108 or via email at chefriverbistro@gmail.com.